Eighteen months ago far right group Britain First planned a demonstration in Luton. It was surely a decision that they would come to regret. Today former leader Paul Golding was sentenced to eight weeks in prison and £11,500 costs. A short sentence but a huge cost that may well break the organisation, a registered political party. It's a great development and the story deserves to be told. Yours truly with Rehana Faisal, Muslim community activist, ArchbishopmJustin, Luton Mayor Dave Taylor and Bishop Alan of St Albans. Over the weeks leading up to the demo on 27th June 2015 Bedfordshire Police held their own cards close to their chests. It was clear they were up to something but they did not say what, which was difficult. A few days before the demo we were thrilled when they served notice on BF leaders that they were seeking a High Court injunction to ban them from Luton for the demo day, and from mosques around the nation. An interim hearing the day before demo day turned down the ban from Luton but upheld the ban from mosques without invitation until a full hearing took place. The demo took place peacefully, BF went away and we wondered what next. BF held a highly publicised so called "Christian Patrol" without announcement in Bury Park on Saturday 23rd January this year. The story of the day is here in a personal piece I wrote for Hope Not Hate and there are videos etc of the church's response here. The ban on entering mosques was still in place, and the police announced they were still seeking a final hearing. In the interim they enforced bail terms that banned Paul and Jayda from the town. BF minus their leaders were in Luton town centre again two weeks later - Paul and Jayda claimed they controllled operations via Skype from their control room - a pub in S London! Meanwhile our response as churches had received nationwide and international overage, and resulted in BF and their Christian Patrols being condemned by pretty well every major British church. The police began a series of moves that brought Paul to a hearing at the magistrates court in late July. He pleaded guilty to a charge of wearing political uniform. The story is told here. Street Movement, Political Party or ... Jayda was here the following week and pleaded not guilty so was committed to a hearing in early November. Nothing exciting happened that day though they claimed they were chased out of luton by mobs of Muslims. I tell the story of what didn't happen here! Then a week later, contrary to everything they'd been saying about fighting the High Court injunction, Paul and Jayda conceded and agreed to its terms out of court. This is Good News! Details of the Injunction are linked there. They returned to Luton a last time in November for Jayda's hearing on wearing a political uniform and religiously aggravated abuse of a young woman and her family. (A Good Verdict in Luton ) The sense of achievement was added to when at lunchtime on the first day of the trial Paul was served notice of today's hearing for breaking the terms of the injunction. 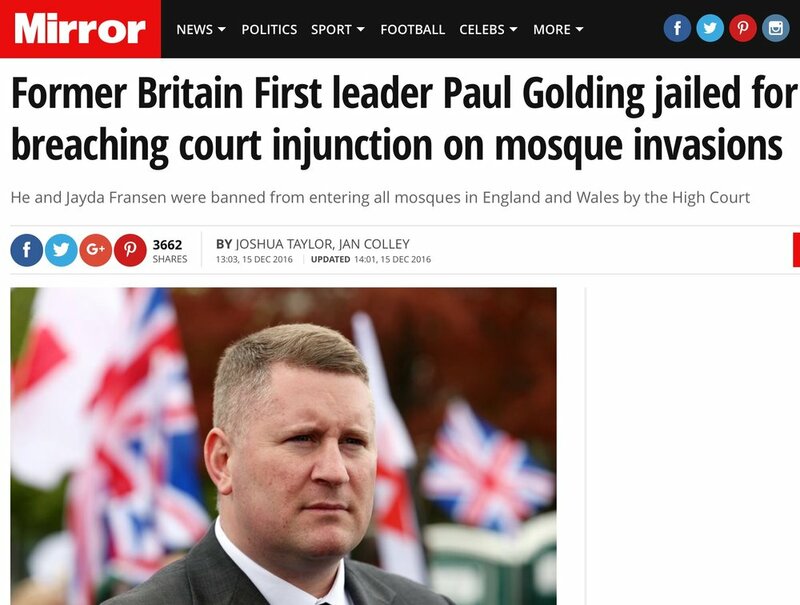 It was brought on because just a few days after signing the injunction Paul drove a group of BF activists to Cardiff where they "invaded" a mosque, the Al- Manar centre. Golding himself didn't go in but it would be hard to argue he didn't play a part in what happened. He was clearly testing the injunction about as far awZy as he could get from the High Court. I don't claim any particular part in today's conviction, but was coincidentally in Cardiff a month later speaking on our work challenging the far right in Luton. I met the Iman and members of the mosque, heard their distress at the incident and brought them sympathies from the whole community if Luton. So it was particularly pleasing to see the verdict. Let's just say this. Britain First took on the Luton community and Bedfordshire Police at their peril. Having EDL based here over five years meant we didnt just deal with a couple of demos but with their consistent rabble rousing in our community. As a result we learnt some key lessons. So when BF announced a demo in June 2015 they weren't prepared for our response. We are proud of the Luton story. We still have a long way to go, but as Muslims and Christians, people of faith and none, community and police and council, we've learned to work together. We are not giving up. I's fair to say anyone else doing so will face the same opposition.